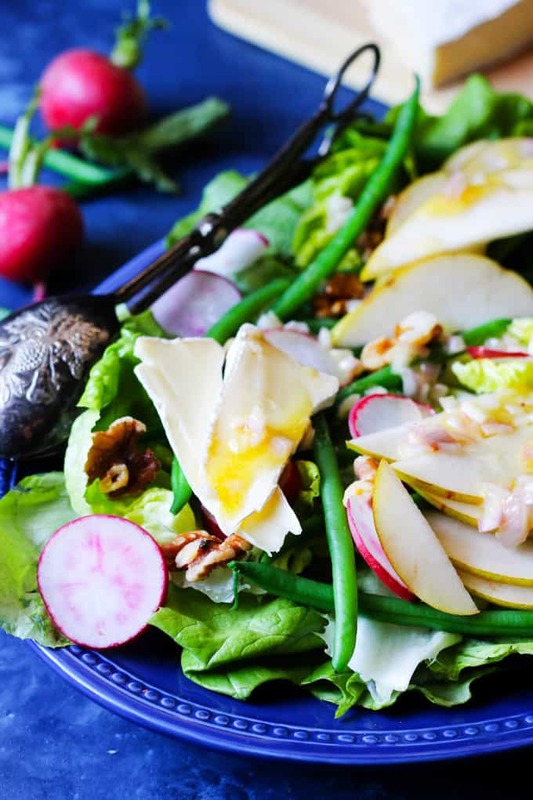 French Salad with Brie and Pears is a wonderful option for those nights when you want to eat a salad but you desire a bit more than just a simple Green Salad. This French Salad recipe is perfect when you want to eat low carb meal without sacrificing on taste and nutrition. 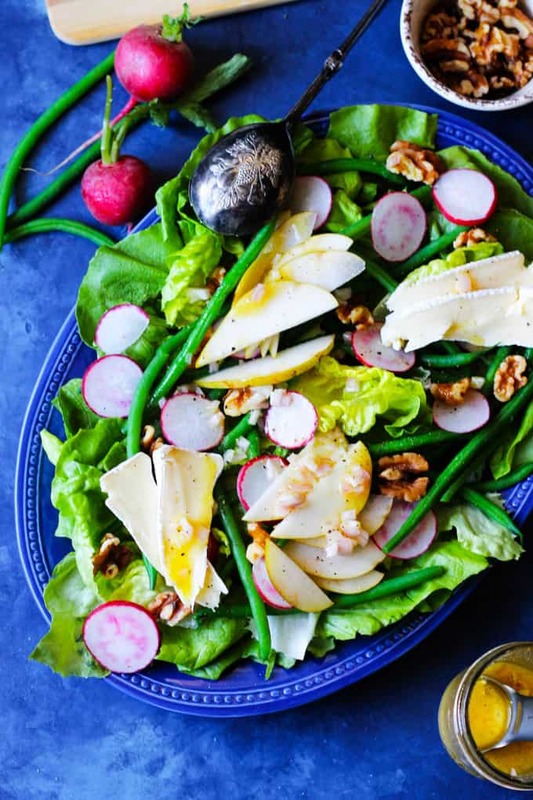 Butter lettuce, French green beans, radishes, and pears add a healthy dose of vitamins; and walnuts – give you some healthy fats; and finally the brie cheese – will provide you with needed protein. This salad is naturally gluten-free, and oh so delicious! Pair this wonderful French Salad with a French Vinaigrette and you’ll surely be making both of these over and over. I know that a lot of you are on a health kick for the beginning of this New Year (keep the fight alive). Regardless of whether it’s in furtherance of resolution, I know that many of you find it important to eat meals that are low in carbs. Well rest easy, this French Salad is here to help you out. 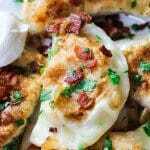 It is super delicious and super quick to make. It is packed with nutrients and is very low in carbs. Yes, it has a pear in the ingredients and if you want to avoid any sugar, then replace it with, for example, a cucumber. I love pears and I think that their nutritional value outweighs the little bit of sugar that it naturally contains (and it’s not refined sugar, so you should feel better about that). And yes, this salad has a brie cheese in it, which is not necessarily low in calories, but it’s full of protein and will help you stay full longer. However, if you want to avoid it, then I’d substitute it with hard-boiled egg if you still want to have this salad as a meal. Step 1: In a pot, bring water to boil. Add salt and cook French green beans for about 3-4 minutes until they’re crispy. In the meantime. prepare ice water in a bowl. Transfer the beans to the bowl with ice water to stop the cooking process. Once the beans are cooled off, transfer them onto the paper towel to dry them out. Step 2: Remove the core from the lettuce (discard leaves that do not look good) and place the remaining leaves in cold water – let them sit there for a few minutes to make sure that all the sand and dirt will drop to the bottom of the bowl. You may also want to rinse the leaves under the running water. Then transfer the leaves in batches to the Lettuce Dryer (affiliate link) and dry them well. Step 3: Thinly chop radishes, pears and brie cheese. Step 4: Assemble the salad. 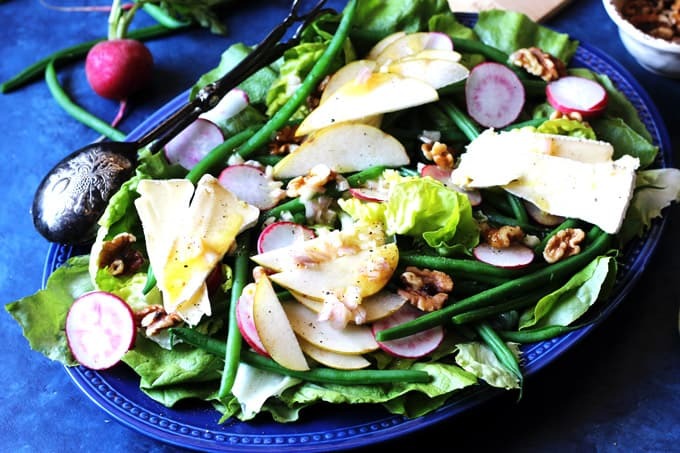 Add as follows: lettuce, green beans, radishes, walnuts, pears, and brie. Dress with a French Vinaigrette and enjoy! Oval platter (affiliate link) to serve – you will need it only if you want to serve it the way I did it; otherwise, a bowl will be fine. Ham and Cheese Soup with White Wine and Gruyere. 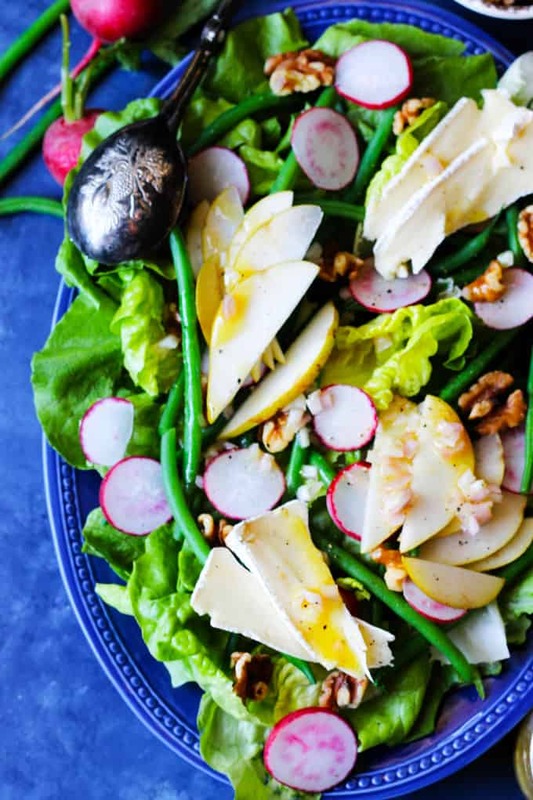 French Salad with Brie and Pears is a wonderful option for those nights when you want to eat a salad but you desire a bit more than just a simple Green Salad. 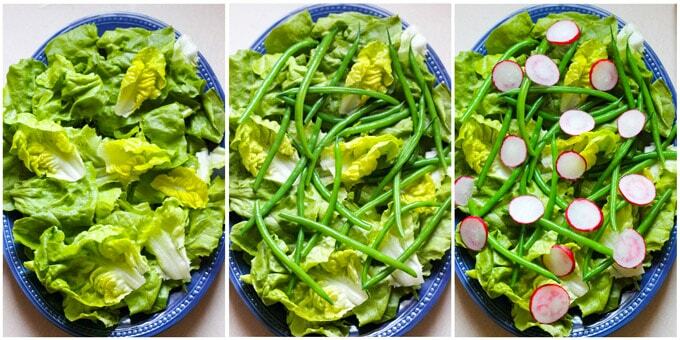 This French Salad recipe is perfect when you want to eat low carb meal without sacrificing on taste and nutrition. 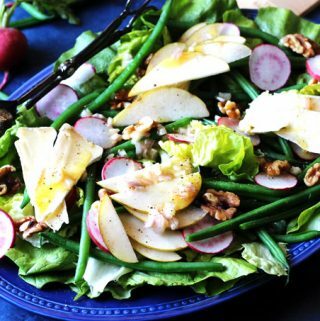 Butter lettuce, French green beans, radishes, and pears add a healthy dose of vitamins; and walnuts - give you some healthy fats; and finally the brie cheese - will provide you with needed protein. This salad is naturally gluten-free, and oh so delicious! In a pot, bring water to boil. 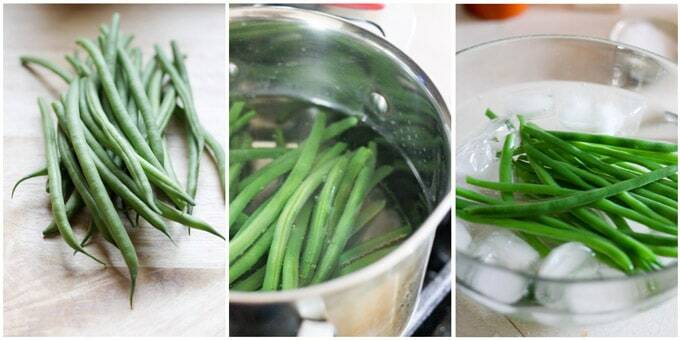 Add salt and cook French green beans for about 3-4 minutes until they're crispy. In the meantime. prepare ice water in a bowl. Transfer the beans to the bowl with ice water to stop the cooking process. Once the beans are cooled off, transfer them onto the paper towel to dry them out. Remove the core from the lettuce (discard leaves that do not look good) and place the remaining leaves in cold water - let them sit there for a few minutes to make sure that all the sand and dirt will drop to the bottom of the bowl. You may also want to rinse the leaves under the running water. Then transfer the leaves in batches to the Salad Dryer and dry them well. 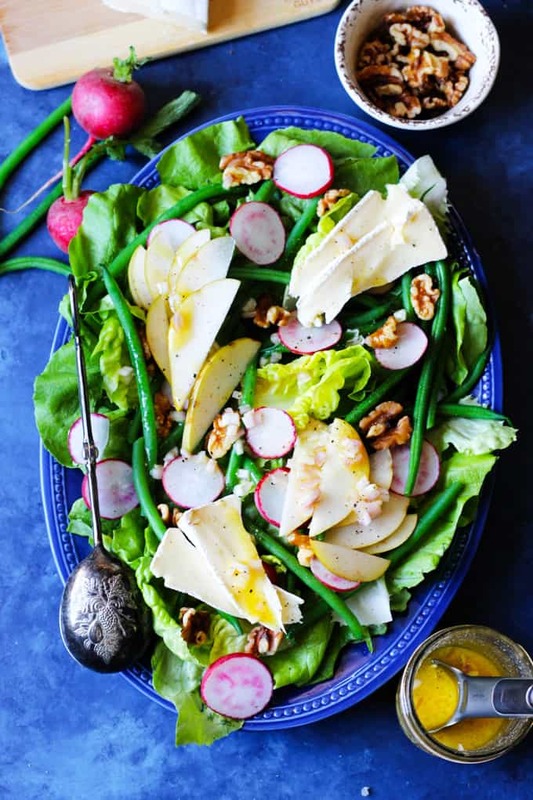 Thinly chop radishes, pears and brie cheese. Assemble the salad. 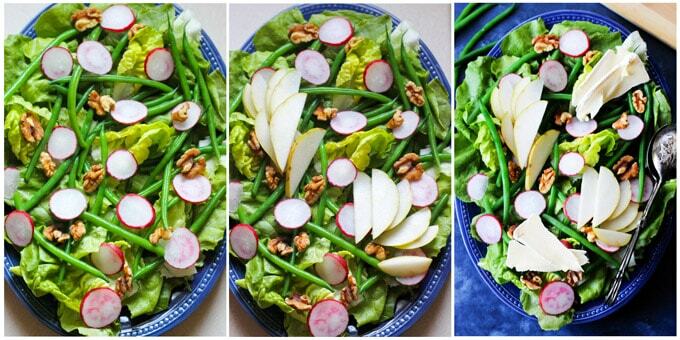 Add as follows: lettuce, green beans, radishes, walnuts, pears, and brie. Dress with a French Vinaigrette and enjoy! 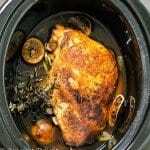 The nutritional value was calculated based on a portion as a side dish of 4 servings. 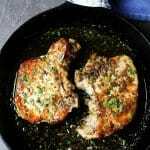 If using the recipe for the main dish, this recipe would produce 2 servings. This salad looks so flavorful & filling – and I have been known to eat a salad for breakfast! Love the choice of ingredients and dressing to this delicious and colorful Salad. Great Salad for my next weekend Dinner with family. 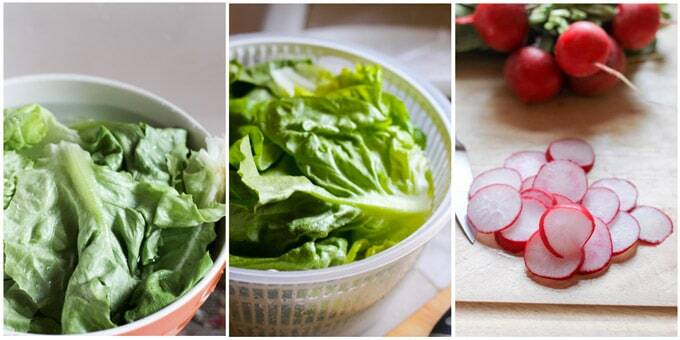 I love simple salad recipes especially ones filled with delicious vegetables and crunchy nuts. This looks great for a side to dinner or a nice lunch. Absolutely! Thanks a lot Erin. Every salad you make causes drool reaction ;). And that rarely happens with a salad. I’m making this salad. Looks so, so delicious!! Absolutely wonderful….you are a terrific chef! Thanks.